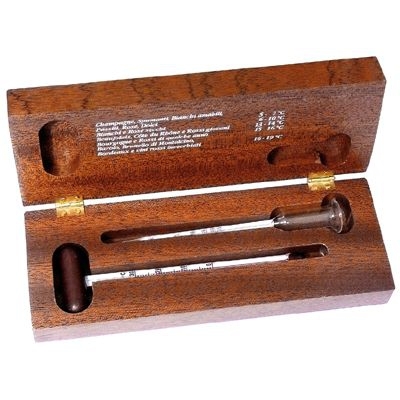 Twin wine gift set of a wine thermometer and alcoholmeter together in a smart wooden case. This would make an ideal present for any wine lover - why not add a bottle of wine or two? 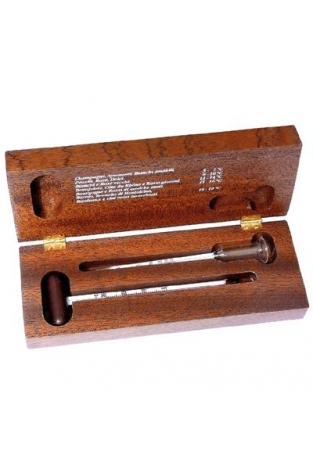 A gift set of a wine thermometer and alcoholmeter presented in a smart wooden case. This is an ideal present for the wine connoisseur or student of wine or why not simply treat yourself. Now you can test the accuracy of the alcohol content by volume declared on the bottle. A recommended temperature guide for a selection of well-known wines is included to help you serve wine at the temperature that allows its qualities to come to the fore. In order to obtain the most accurate reading of the wine's alcohol content by volume the sample should be at a temperature of approximately 20°C. Holding the alcoholmeter with the reservoir uppermost pour a small quantity of wine into the tube and wait until it begins to drip out of the tube. Invert the alcoholmeter onto a flat surface allowing the remaining wine to drain away. When the flow has stopped the liquid remaining in the tube can be read against the scale to reveal the alcohol content by volume. After use please ensure that the equipment is thoroughly rinsed with plain water to remove all traces of alcohol ready for the next reading.